Located in the heart of the Caribbean archipelago, Martinique, island of flowers, is part of the Lesser Antilles or "Windward Islands". 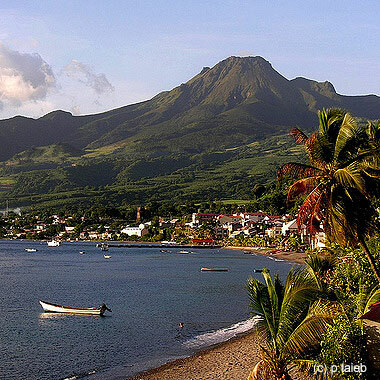 Covering an area of ​​671 sq.miles, Martinique is 50 miles at its greatest length and 25 miles at its widest point. Its coasts are bathed at the east by the Atlantic Ocean and at the west by the Caribbean Sea. Located 2000 miles from NYC and 4500 from France, its nearest neighbors are, to the North Dominica, 15 miles, and the other French island of Guadeloupe by 80 miles.25 miles to the South is St. Lucia. Its mixed population is approximately 395,000 inhabitants. The climate is relatively mild in Martinique and the heat never excessive. The average temperature is 26 °C (79°F), and not much less for the sea making it the island of "eternal summer". Discovered by Christopher Columbus in 1502, the island was inhabited by various Native American peoples before being exterminated by the French who set up in 1635 the Company of American islands. 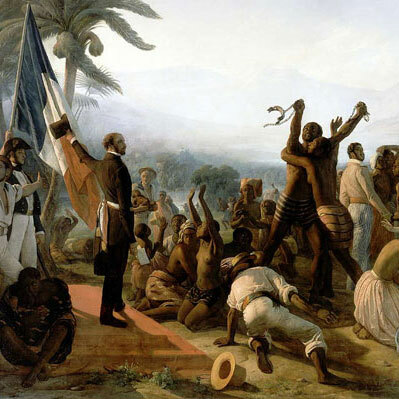 Slavery developed from the 1670s to meet the high demand for labor in sugar plantations. It will be abolished on the May 22, 1848. From the second half of the seventeenth century Martinique is marked by wars involving the French, Spanish and English and this until 1763. May 8, 1902, the eruption of Mount Pelée volcano destroyed the city of Saint-Pierre killing 30 000.The volcano is now closely monitored, be reassuredv! Martinique is a French overseas state since 1946. Explore the rainforest and volcanic relief. Dominated by Mount Pelée (peak altitude of 1397m / 4584f), the Pitons of Carbet and Morne Jacob, this part of the island offers beaches of black sand from the volcanic erosion in a succession of small calm bays that house many picturesque fishing villages. Do not hesitate to take the road of “La Trace”, with our rental car, taking you to the heart of the rainforest. The north is where bananas and pineapples a grown. The Caribbean Coast is caressed by the blue and calm waters of the Caribbean Sea offering beautiful white sand beaches surrounded by palms trees. You will discover them at the wheel our your rented car. From Trois Ilets, Anses d'Arlet, Diamond Rock and to Salines beach in Sainte-Anne, the South is the true Caribbean postcard, there are superb beaches with crystal clear water and white sand. Atlantic Coast, or "windward coast" emanates a particular charm of contrasts. At the South, Le Vauclin and the peninsula of the Caravelle, are nursed by the turquoise waters protected by the coral reef. White sand shallows stretches to Le Francois and his famous Josephine Bath and the numerous islets of the beautiful bay of Le Robert whose peace and calm contrast with the ceaseless surf of the Atlantic Ocean tumultuous waves assailing the steep volcanic coasts and North. 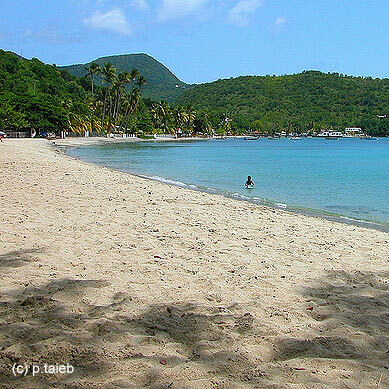 Martinique has over 50 beaches to discover with your rental car, more than enough for a successful stay. Les Salines Beach iconic white sand southern Caribbean lined with coconut trees it stretches over more than one and half mile. Anse Noire and Anse Dufour, false twins, black sand for one and one white for the other,sea turtles are commonly encountered. Les Anses d'Arlets, the church and the pontoon are regularly the making covers of magazines. 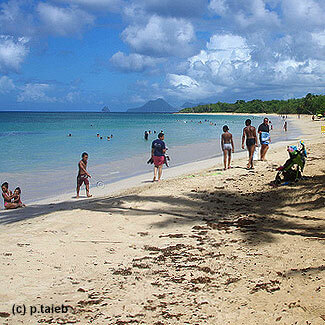 Anse a l'Ane, family beach with calm waters facing the islet Ramiers, suitable for children. Anse Couleuvre, the “end of the road” beach in the North Caribbean, black sands and lush vegetation. Tartan, pretty beaches on the peninsula, paradise of surfing and stand up paddle. Grand and Petit Macabou, beautiful remote wild beaches. 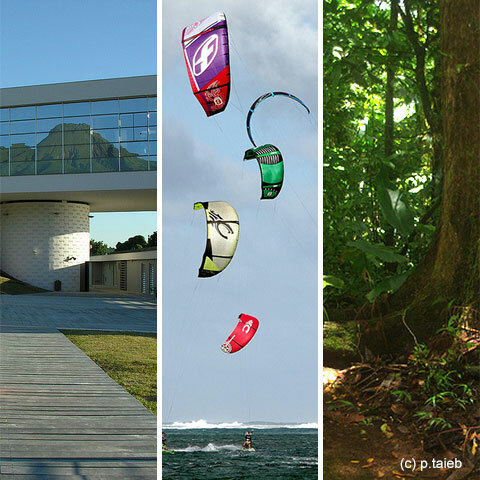 Martinique, with its tropical climate, is covered with exuberant vegetation: lavish tropical forests, savannas, countless species of trees, fruits, plants and flowers, not to mention the mangroves. Making the island an extraordinary garden to discover with your rental car. 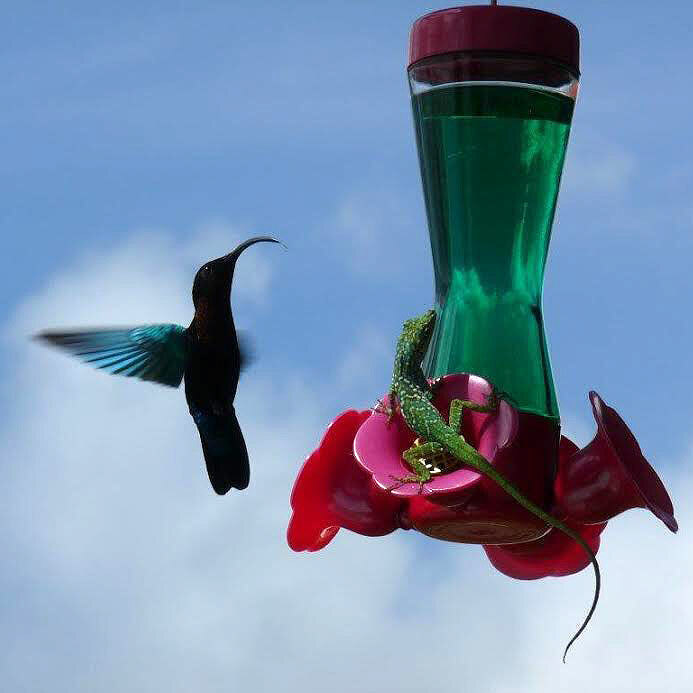 Fauna, mainly consisting of birds, fish and crustaceans, is also enriched by small lizards, "Mabouyas" and "Anole", Iguanas, not to forget the Manicou, a small endemic member of marsupials. The Mongoose, however, was introduced by man. Hikers expectations will be met, Martinique is highly suitable for the practice of hiking. The island has no fewer than 120 miles of marked trails! difficulty levels are highly variable and it is possible to find routes to suit all tastes. As an agriculture focused land, with banana, sugar cane, rum, melon and pineapple, Martinique has rich terroir flavors. Rum from Martinique AOC (registered designation of origin) is produced by eleven distilleries whose best known are Neisson, St. James, Bally, JM), La Favorite, Depaz, Dillon, Habitation Saint-Etienne Clement, La Mauny, Trois Rivières and Duquesne . Rum from Martinique is made direct from the sugar cane, unlike most other Rums using molasses left over after extracting the sugar from the canes, that why it taste so gooooood. White Rum is non aged, amber Rum is mildly aged and old Rum is aged , often in used American Bourbon casks. Take care not to sample too many Rums before hitting the road back! 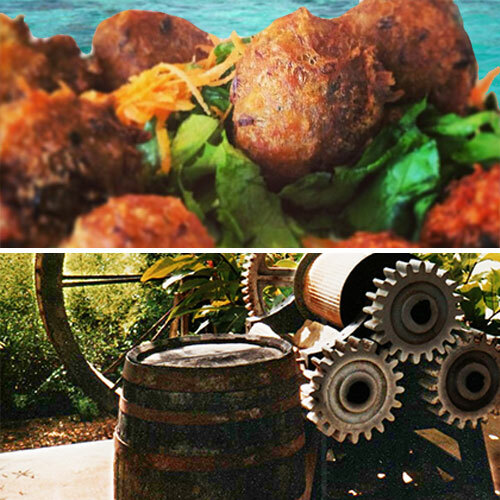 Creole cuisine draws its character from the very history of the Caribbean. The original mixture of peoples contributes a lot to the character of Creole cuisine with a French twist.You will enjoy the local curry (Colombo), the fritters (accras), black pudding (boudin), smoked chicken(poulet boucané) and other typical delicacies.